After Christmas, I found bags of giant peppermint marshmallows!! I had visions of wonderful cups of hot chocolate, but, it turns out, I prefer a candy cane in my hot chocolate instead, so what to do with all of these marshmallows? 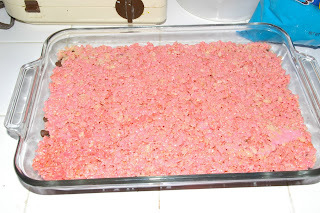 RICE CRISPY TREATS!! Since I was already thinking of the peppermint+chocolate combination, I thought I would try making rice crispy treats with peppermint marshmallows and incorporating milk chocolate chips somehow. In an effort to avoid rock-hard crispy treats, I melted the butter in the pan on low heat and then added the marshmallows. I stirred and stirred and stirred until all of the marshmallows were melted, then turned off the heat, added the rice crispies, and stirred until the mixture was well-combined. 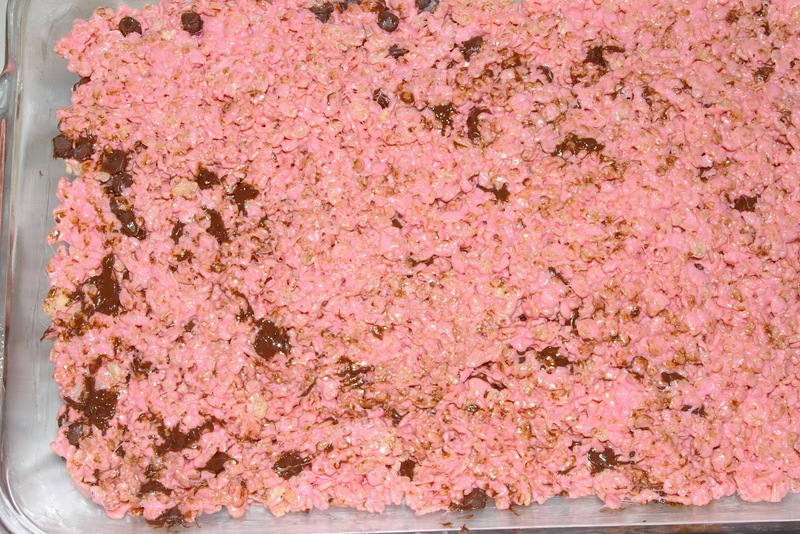 I pried scraped the mixture into the prepared pan and pressed down gently to make the chocolate chips stick. I think these would make a good Valentine's Day treat too! 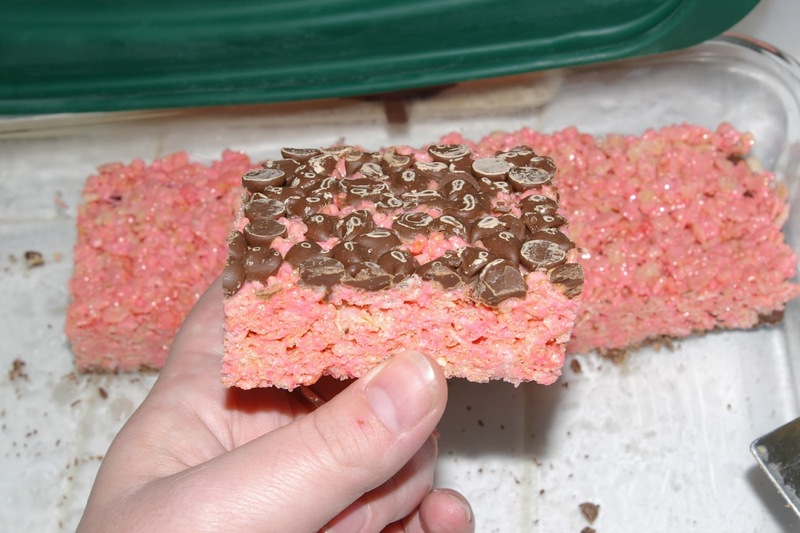 I was a little surprised that the chocolate chips and crispy treats were so similar in thickness. Verdict: Despite my best efforts, these were still harder than I had hoped. They tasted good in an I-am-eating-chocolate-and-marshmallows-and-lots-of-sugar kind of way, but I thought there might be room for improvement. 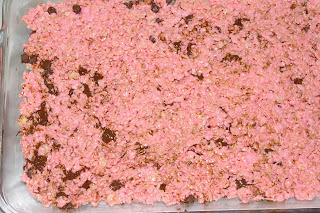 I wasn't sure if the reason I hadn't liked Batch #1 as well as I thought I would was because there was too much chocolate (VERY hard to imagine) which overwhelmed the subtle peppermint flavor or because it was all on the bottom which broke the treat into two distinct tastes, so I decided to mix the chocolate into the marshmallow/rice crispies mixture this time, before prying scraping it into the pan. But when I went to get the milk chocolate chips out, I didn't see any, and I was too tired to hunt for them, so I grabbed the bag of white chocolate chips I found and decided to try those instead. GOOD CHOICE!!! 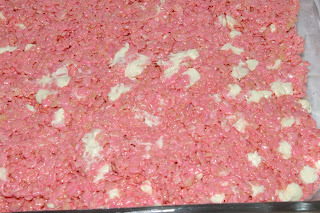 Still trying to avoid the rock-hard finished crispy treats, I melted the butter on low again and then added the marshmallows. But this time, I turned the heat off BEFORE all of the marshmallows were completely melted. I continued to stir until all of the marshmallows had melted, added the cereal and stirred until the mixture was well-combined, then added the white chocolate chips and tried to quickly stir them in without melting them. It seemed harder to pry scrape the mixture out of the pot this time; maybe adding the white chocolate chips made the whole thing turn to cement cool more quickly. The white chocolate chips did melt a little, so I may have to practice and practice and practice to perfect my technique! The verdict: OH THE YUMMINESS!!!! 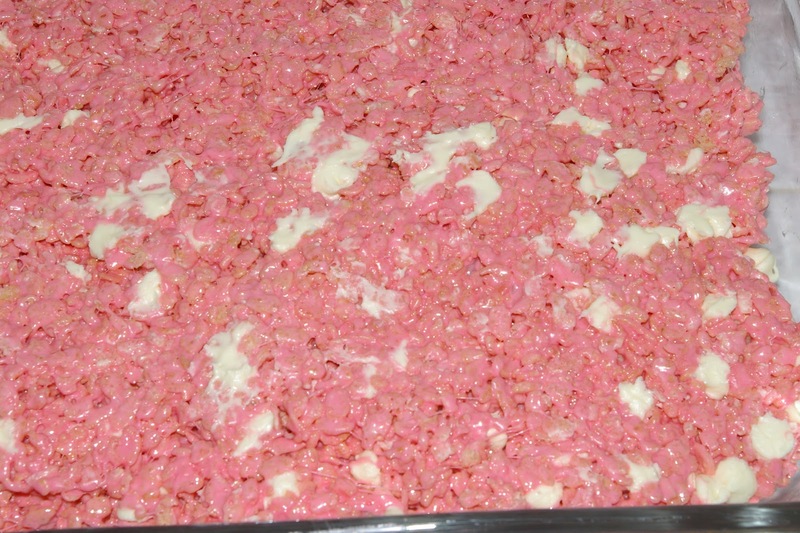 This batch of crispy treats SAVED LIVES, let me tell you! They WERE nice and chewy, instead of rock hard! And I thought the white chocolate complimented the light peppermint flavor, without overwhelming it. But! I'm not sure if I liked it better because I used white chocolate instead of milk chocolate, or because I mixed the chips in, or because I used less, so this means further batches will be necessary! In order to cut down on the number of variables being changed, I decided to make batch #3 the same as Batch #2, only changing one thing: white chocolate chips back to milk chocolate chips....well, and buttering the pan more thoroughly....but I STILL couldn't find any milk chocolate chips! I found a bag of semi-sweet mint chocolate chips, so I used those instead. Still trying to avoid the rock-hard finished crispy treats, I melted the butter on low again and then added the marshmallows. I turned the heat off BEFORE all of the marshmallows were completely melted. 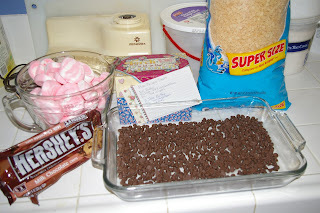 I continued to stir until all of the marshmallows had melted, added the cereal and stirred until the mixture was well-combined, then added the mint chocolate chips and tried to quickly stir them in without melting them. 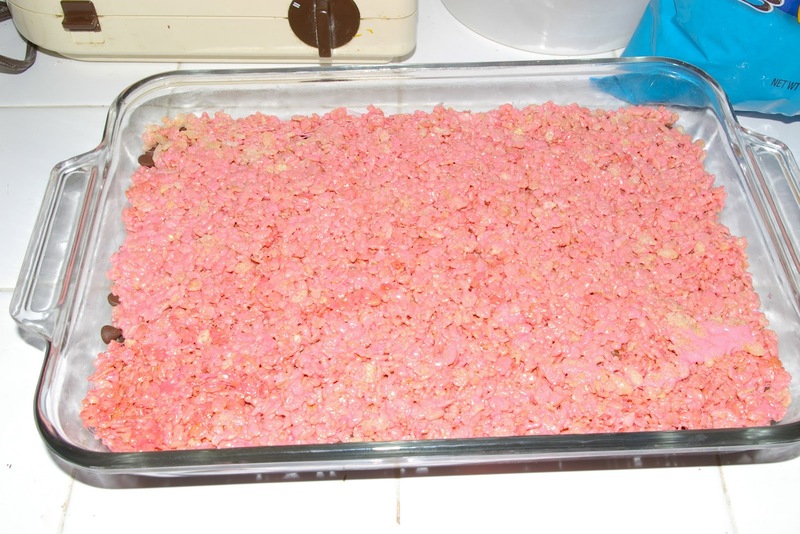 As I was trying to pry scrape the mixture out of the pot this time, I remembered the main reason I do not usually make rice crispy treats: I hate fighting with the hot pot while trying to get the quickly-hardening cement sticky mixture out and into the pan! The melted chocolate was a little more evident this time. The verdict: I didn't think I would like the semi-sweet chocolate with the completely-sweet marshmallow mixture, but I did! Maybe it was because the mint in the chocolate chips complemented the mint in the marshmallows very nicely, but, whatever it was, this batch turned out to be my second favorite, after the white chocolate batch. To test my theory about not liking the chocolate on the bottom of the pan, I made another batch using white chocolate chips spread on the bottom of the pan, like in Batch #1. I didn't like it NEARLY as well as the batches with the chocolate chips mixed in. JUST TO BE CERTAIN, I made another batch with the white chocolate chips mixed in. My hand may have, uh, slipped when I was pouring the marshmallows in the pot, and I added the entire bag of white chocolate chips after the cereal was mixed into the melted marshmallows. DELICIOUS! 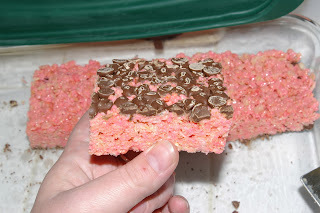 Thanks to the extra marshmallows, and turning the burner off before all of them were melted, these crispy treats were wonderfully soft and chewy! 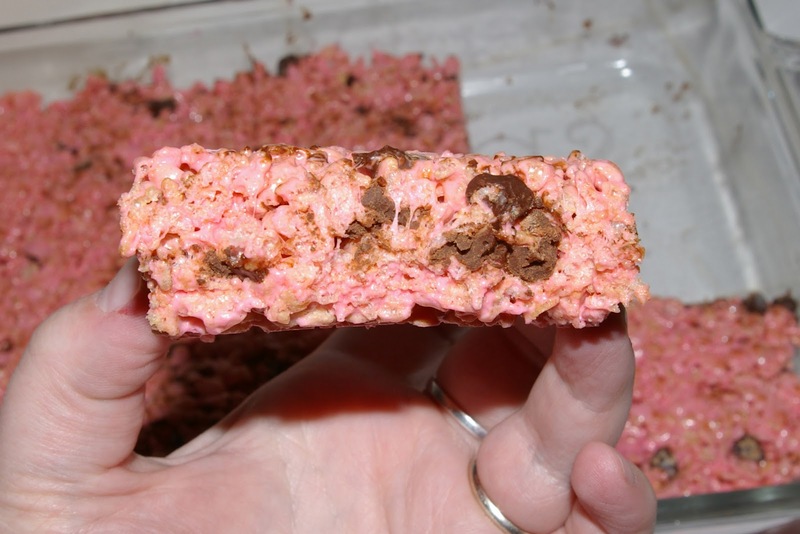 Various forms of chocolate are delicious in rice crispy treats but should be mixed in as opposed to layered. Of course, before the results of research can be taken as FACTS, they must be confirmed by additional people doing the same experiments with the same results, so get on that, will you? It's for the sake of SCIENCE! And these would be easy to make dairy free with the right chocolate! I thank you very much for your contributions to science. I do so appreciate the sacrifices you made in the cause of science. Looks like there are some experiments in my future. nowheymama--*headdesk* I WISH I would have thought about that when I was nursing and avoiding dairy for the sake of screaming babies! Jessica--I'm not sure; I've noticed a few new varieties of marshmallows lately, but I haven't paid close attention. Honestly, though, the peppermint flavor from the marshmallows is VERY mild; I think there's more food coloring than peppermint flavor. Extract is an EXCELLENT idea! And that WILL take a lot of experimentation since those extracts can be so potent ;-). Liz--Thank you! It's so refreshing to be appreciated for the hard things I do ;-)! I love that you made the rice crispy treats so many times in a row. You make me laugh. I am sitting here eating my sad little diet lunch and feeling as if I could eat a whole lot of those treats right about now. Your groundbreaking work makes me wonder if there would be any exciting developments resulting from the substitution of Peeps for one of the variables in this equation. Yum! I'm glad you did the experimenting for the betterment of us all. How thoughtful and giving of you! I hadn't thought of using Peeps! What an promising idea! I'll let you know how it goes if I ever feel up to fighting with sticky crispy treats and my pot again =)! Emily--It's so HARD, but I do my best ;-). This post combines two of my great loves: science and dessert. And in all seriousness, things like this would make a great homeschooling lesson - teaches kids the scientific method, variables, fractions. I shall do some "experiments" this weekend with my kids.